There are several objectives for this English lesson on editing and proofreading skills for elementary students. First, students correctly identify and correct spelling and grammar errors by working cooperatively on a classroom exercise. Second, they are introduced to and begin to learn basic editing marks. Finally, students practice using the editing marks to edit and proofread other students' work. On a chalkboard or whiteboard, write the information given in the section below (correct this advertisement). Have the students copy it exactly as it is written on a sheet of lined paper. Using the editing mark listed below (three stacked lines), have them correct the advertisement using a red pencil. There are deliberate capitalization errors in this advertisement because the object of this lesson is to have the students identify such errors and learn to correctly use capital letters. Learning proper capitalization is one of the easier proofreading skills for elementary students to grasp. we offer dinner specials from 5pm to 8pm on thanksgiving and christmas. Try our captain bob cheeseburgers or enjoy fresh, hot Sandwiches. Instruct the students to copy the exercise on their paper and correct the errors. When everyone has finished the exercise, ask for volunteers to come to the board, correct one of the mistakes, and explain why the information was wrong by giving the appropriate capitalization rule. For instance, in the first sentence, the word "we" should be capitalized because it is the first word in the sentence. Continue until the class finds all seven errors, and then ask them to self-check and correct any errors on their papers. Answer key: capitalize the following: we, thanksgiving, christmas, captain, bob, our. The word "sandwiches" should not be capitalized. In the second part of the lesson, students write their own advertisement for a restaurant. Explain that a good advertisement will make the reader want to have a meal after reading the ad, but too many errors in the ad could make them decide to eat elsewhere. The advertisements should be short but engaging. After the advertisements have been written, let the students exchange their ads with one another for editing and proofreading. If time permits, allow the students to volunteer to read their ads out loud. Extend the lesson by providing art media and encouraging each child to create a poster and make their advertisement more realistic. Hang the finished ads up to decorate the room. This is a good time to introduce basic editing symbols; however, don't expect students at this grade level to internalize all of them immediately. The best way to teach these marks is by introducing them one a time. Work on one mark until it is mastered and then move on to the next. By the end of school year, most students should know and feel comfortable proofreading and editing independently while using the appropriate marks. Three stacked lines ≡ means to capitalize. The / symbol is to make the letter lower case. To add text, use the ^ symbol. A circle with a dot in the center means to add a period. A squiggle line, which looks similar to a badly written cursive lower case letter “e", means to remove a letter or text. 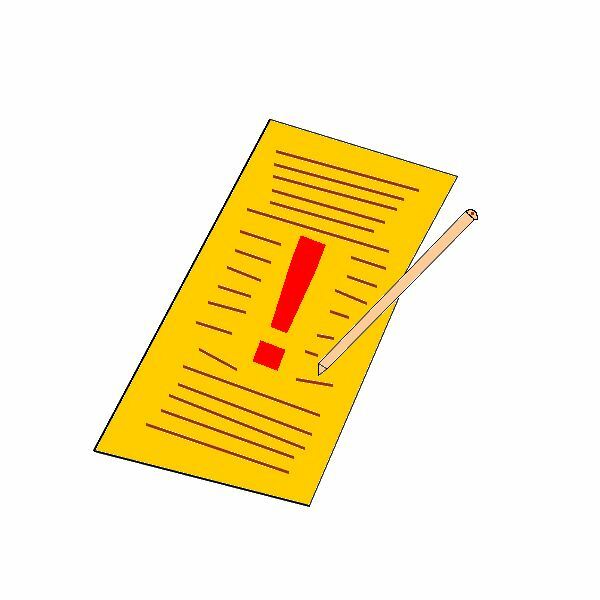 Ask the students to use a red pencil whenever they are correcting their own or others' work. Make grammar and spelling fun while teaching editing and proofreading skills, and the students will internalize and remember the concepts better and longer.